The Villa Carlotta is a 17th century Italian garden filled with terraces, statues, fountains, old trees and monumental azaleas and rhododendrons all hovering above Lake Como. This beautiful site inspired the Vicenza Design flora line of cabinet hardware, Carlotta. The Primavera designed large knob with backplate is available in Antique Brass, Antique Copper, Antique Gold, Antique Nickel, Antique Silver, Gunmetal, Oil-Rubbed Bronze, Polished Gold, Polished Nickel, Polished Silver, Satin Nickel, Two-Tone and Vintage Pewter finishes. Mounting hardware is included. 100% lead free pewter. Handcrafted in the USA. The Villa Carlotta is a 17th century Italian garden filled with terraces, statues, fountains, old trees and monumental azaleas and rhododendrons all hovering above Lake Como. This beautiful site inspired the Vicenza Design flora line of cabinet hardware, Carlotta. 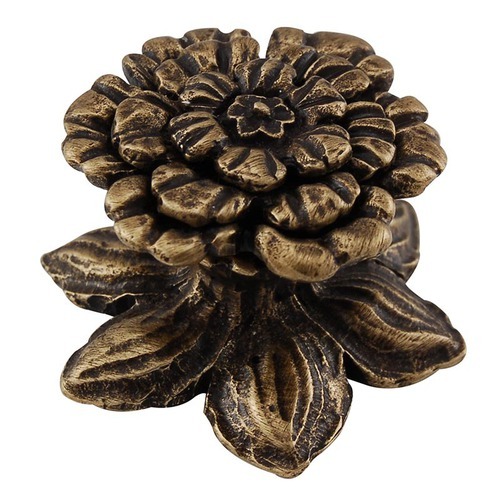 Round leather knobs are accented with a pewter daisy. Leather choice includes black or brown. Available finishes include Antique Brass, Antique Copper, Antique Gold, Antique Nickel, Antique Silver, Gunmetal, Oil-Rubbed Bronze, Polished Gold, Polished Nickel, Polished Silver, Satin Nickel and Vintage Pewter. Mounting hardware is included. 100% lead free pewter. Handcrafted in the USA. The Villa Carlotta is a 17th century Italian garden filled with terraces, statues, fountains, old trees and monumental azaleas and rhododendrons all hovering above Lake Como. This beautiful site inspired the Vicenza Design flora line of cabinet hardware, Carlotta. The three-piece premevera designed large knob. Available finishes include Antique Brass, Antique Copper, Antique Gold, Antique Nickel, Antique Silver, Gunmetal, Oil-Rubbed Bronze, Polished Gold, Polished Nickel, Polished Silver, Satin Nickel, Two-Tone and Vintage Pewter. Mounting hardware is included. 100% lead free pewter. Handcrafted in the USA. The Villa Carlotta is a 17th century Italian garden filled with terraces, statues, fountains, old trees and monumental azaleas and rhododendrons all hovering above Lake Como. This beautiful site inspired the Vicenza Design flora line of cabinet hardware, Carlotta. The sunflower designed large knob. Available finishes include Antique Brass, Antique Copper, Antique Gold, Antique Nickel, Antique Silver, Gunmetal, Oil-Rubbed Bronze, Polished Gold, Polished Nickel, Polished Silver, Satin Nickel, Two-Tone and Vintage Pewter. Mounting hardware is included. 100% lead free pewter. Handcrafted in the USA.